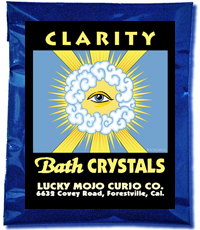 The effulgent beauty of God's all-seeing eye graces our extremely popular line of Clarity Oil, Clarity Bath Crystals, Clarity Incense Powders, and Clarity Sachet Powders. When situations and conditions are confused, muddled, and difficult to perceive, hoodoo practitioners rely on Clarity spiritual supplies to open their eyes - and the eyes of their clients - to the truth. Is someone telling the truth or lying? Is someone faithful or cheating? Is a promise going to be delivered on or was it just a stall? 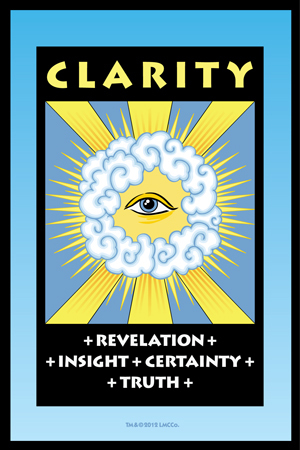 If you do not know - if you NEED TO KNOW with certainty and assurance - then you can use Clarity supplies to bring forth the answers you need! Additionally, Clarity spiritual supplies are employed by folks who themselves feel confused, who are facing "too many choices," or who are unsure of what direction to take. 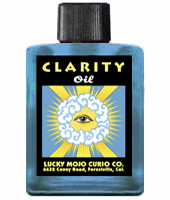 Clarity supplies, combined with Road Opener supplies and utilized in a private rite of prayer and quiet meditation, can provide revelations, insights, and an end to doubt. If you are having a difficult time telling truth from lies, making decisions about your future, or coming to terms with the motivations that caused people or situations to become difficult for you in the past, this simple Clarity spell may open the doors of perception and do away with muddled confusion. All you need is a packet of Clarity Bath Crystals, a bottle of Clarity Dressing Oil, and a small white candle, such as a tea light or 4" altar light. Proverbs 20:12: The hearing ear, and the seeing eye, the Lord hath made even both of them. Rinse your face with clear water, and wipe it dry. Use the Clarity Oil to dress your little candle and also to anoint above your eyebrows and on your forehead, in the area sometimes called "the third eye," as you pray in your own words to see the truths and the lies around you, to bring in helpful messages and signs of divination and prophesy, and to experience important insights relating to your past, your present, and your future. You may repeat this simple work daily or weekly, as you feel best, until your eyes and ears are opened to the knowledge that you desire. If the situation concerns a false friend who is lying about you or someone who made promises but is not keeping them, and you want to know with utmost clarity what this person truly intends, it is a good idea to attempt contact and to ask one question while the candle burns. Do NOT get into an argument or extend the conversation in any way. Just ask for the information that you need. If the person is one who has been stubborn in the past, you may add Compelling Oil to the candle dressing -- but do not wash your own face with Compelling products. The answer you receive may not be truthful, but you will gain clarity of insight to discern the truth from the lies. Start with a habit of posting a daily prayer at the Crystal Silence Leaguefor seven days. Do not make it a copy-paste prayer. Think about it and modify it as your days change. Make seven different prayers, one for each area of your life you wish to focus upon. Every day also make it a habit to pray for at least one other member of the Crystal Silence League. You may pray for more, of course. Next, prepare a small space to work at. It does not need to be an "altar" in the usual sense of that word. It could be on a window sill. Get some Clarity Oil and some Clarity Sachet Powder, as well as some Road Opener Oil and Road Opener Sachet Powder. The anointing oil is to dress yourself, any amulets you may wear, and the candles you will light. The powder is for dressing physical papers (because you cannot dress papers that you will be handing to people with oils lest you stain them). You will want a white 7-Knob Candle as well. "By the grace of God and His ministering Angels, may i see my way with clarity and may all the necessary paths become visible to me as i walk toward my new home, my new and better job, my new love, my new friends, and my new state of health [add as many conditions to this list as you like; you will want a total number of 7 wishes]. May my roads be as open as my eyes are clear. May helping hands guide and uphold me as my trusting steps follow my clear spiritual vision. Amen." Dust the paper with a mix of Clarity Powder and Road Opener Powder. You can do this in an outward spiral of powder. Prepare the white 7-Knob Candle by inscribing on it with a in or needle, one wish for each knob. The first wish goes at the top, the second right below it, and so forth, down to the final wish on your paper. Dress the candle with a mixture of Clarity Oil and Road Opener Oil. Place the candle on a stand on the paper. Burn one knob every day at around the same time (day or night, your choice) after you pray for yourself and for others at the Crystal Silence League. If you wish the work to be ongoing, you will want to prepare an amulet, token, or talisman to carry or wear. To do this, otain a piece of jewelry, a Sacagawea dollar, a silver dime, a piece of Hematite or Quartz, or whatever you prefer. Dress your amulet or talisman with a combination of Clarity Oil and Road Opener Oil and set it on top of the petition paper, and on top of that place an overturned white plate, with the candle stand on top of that. Each time you light one of the candle knobs, say a prayer for clarity and open roads in that specific area of your life. Do not make general prayers. Make a specific prayer each day, and do this work right after you post your prayer and pray for others at the Crystal Silence League. You will do this for seven days, until the 7-Knob Candle is finished. In the end, you will have the paper and (if you made one) an amulet, coin, or stone talisman; plus the wax leavings from the candle. Place the paper in your right shoe, to carry your feet forward toawrd your goals. Wear the talisman as jewelry or carry it in your pocket or a pouch, as is fitting. Take the wax leavings to a crossroads and break or sprinkle them in all four directions, saying, "My roads are open" at each of the four directions. I like to advise anyone who is about to undertake a spell of Revenge, Destruction, Damnation, D.U.M.E. (Death Unto My Enemies), Jinxing, or Crossing to spend a simple few minutes engaged in an opening rite of clarity. I say this out of deep concern for the spiritual well-being of those who are overly quick to strike their enemies and who also have the mistaken impression that conjure is essentially a form of cursing. People who think that the best way to solve family and social conflicts is to dominate, destroy, brainwash, rule, control, and generally rip assets away from others are not practicing hoodoo as i know it. I mean, you can use the work in that way, but that is not what most experienced practitioners will tell you to do. Now, twenty years later: Who is married, owns a home, has a business and a couple of young strong kids as employees, has a lot of little old ladies as friends, and is a deacon in the church -- and who is on death row in San Quentin, claiming he's been framed? There are creepy, pushy, mean-hearted, vicious, obsessively controlling, and downright evil spells in hoodoo (as in every form of folk-magic) -- but there are also plenty of kind, gentle, love-enhancing, dignifying, and powerful spells in hoodoo (as in every form of folk-magic). You have to set your MORAL COMPASS first, then select your spells. If you are confused about what is right and what is wrong, take a simple Clarity Bath or anoint your head with Clarity Oil. then light a white candle and read some of the ethically, morally, and socially instructive portions of the Bible -- the 10 Commandments, Proverbs, Parables, Golden Rule, Lord's Prayer -- and ponder on them. Matthew 7:12: "Do unto others as you would have them do unto you." If, after a moment of calm insight, you still feel that your path is one of vengeance, then take up your sword and shield and go into battle knowing that you do so by choice and not in a state of confused emotions. 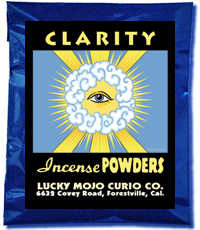 Order Clarity Oil from the Lucky Mojo Curio Co.
Order Clarity Incense from the Lucky Mojo Curio Co.
Order Clarity Bath Crystals from the Lucky Mojo Curio Co.
Order Clarity Sachet Powder from the Lucky Mojo Curio Co.
Order Clarity Vigil Light Candles from the Lucky Mojo Curio Co.